while i am no lover of the game of football (toothache would be preferable), i believe it has been said by those with an affinity for the game, that it's not a matter of life or death - it's much more important than that. perhaps at least one of the huge gulf of differences between kicking a ball about for ninety minutes, and the earnest venture of spinning about behind bendy bars. it may well be my ignorance of the former, that leads me on a bout of self-congratulation to the world's peloton for not taking itself too seriously. you can't honestly tell me that a sport which features a guy in a devil suit, angels on the top of camper vans, and those basque supporters with green and orange hendrix wigs screaming encouragement even at the motorbike cameras, has its basis in the stiff upper lip? and so it should be, because cycling is life, the rest is mere detail, and if you don't take life too seriously, it logically follows that such apertains to cycling as well. aside from the above mentioned, there is ample evidence that this levity is inherent throughout the genre, none more so than at those rollapaluza roller races. the last notable event on april 19th, was the first of the rapha sponsored international series, which will apparently stretch itself across the pond in the not too distant future. oh, it's serious enough from the point of view of those entered to devastate the opposition - something that, incidentally, came to pass - but there are other invitees who treat the whole affair as the two wheeled festival of enjoyment that it has always purported to be. in fact, so keen were folks to not take it seriously, that the event sold out before the saturday evening was reached. but tribute should be paid to the team of bankers invited to participate alongside the more regular teams of media types, cycle couriers and london cycling clubs. in order that the guardians of our financial well-being should prove immediately recognisable to both supporters and detractors, they were suitably attired as you would expect, including bowler hats, shirts and ties. perhaps unsurprisingly, they won the best dressed team of the evening. in the only serious part of the evening, reigning world junior team sprint champion (who the heck let him in?) reduced the 500 metre time from circa 21 seconds to a less than humorous 19.78, winning not only the night's competition, but lowering the existing rollapaluza record of 19.8seconds. some people just don't know when to stop having fun. i think, by now, i have heard all the arguments for and against helmet wearing, some of which are rather tenuous on both sides, but personally, i have been pro helmet ever since those large dods of polystyrene with the lycra cover. when the issue was raised with kids, who seem generally to be the ones on the receiving end of jibes from their peer group, i was in favour of repeating the maxim it's better to be a fungus than a vegetable; this usually because mushroom head seemed to be the taunt of choice amongst islay kids. i have failed miserably in converting either of my own two, though to say it prevents them choosing to ride their bikes would be stretching credibility. despite both having been provided with not inexpensive machines, sadly neither have the faintest interest in cycling, and whether they wear helmets or not is now a lost cause. however, many of the doubters or agnostics for helmet wearing, hinge at least a portion of their argument on the prospective weight of the object i have been at pains to persuade them to wear. (for while i have no wish to see helmet wearing become compulsory, i feel i would be failing in my duty as a grumpy old man, if i didn't spend at least an hour or two of anyone's time pointing out the error of their way). the weight issue is somewhat of a weak retort in any case; many are marginally over 300g (about 11 ounces in old money), and are particularly well vented these days, so other than flattening an elvis quiff, there's not really a lot to detract from the wearing. so where exactly are we going with this i hear you say (anybody?). well, to bring all up to speed, i have resolved to exercise the company colnago every day this week (weather permitting) and to this end, kitted up this morning just after breakfast, and headed out to debbie's in bruichladdich for a fine sample of double espresso, before returning and settling down to do what people actually pay me for. fellow conversants are somewhat thin on the ground early on a tuesday morning, so i sat only for as long as it took to ingest the caffeine before setting out on the return journey. except, as i reached bridgend, a good six miles from cafe society, i realised that my noggin was no longer protected by its catlike whisper. granted, it bore the peugeot casquette with bp on the sides, so those passing would not have failed to recognise me as i waved at speed, but it appears that having removed the catlike while supping, i had neglected to replace it on leaving. i did, of course, immediately retrace my tyre tracks to retrieve the helmet, but i shall be even less likely to give listening room to anyone who levels the weight argument in my next helmet discussion. and yes, i do feel like a total prat. consider the humble jersey. 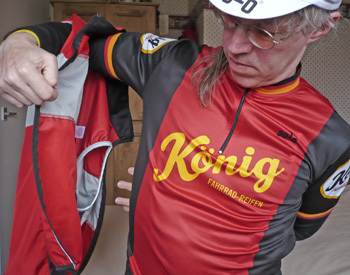 perhaps unsurprisingly, we tend to take our cycle jerseys for granted, and that's almost how it should be. 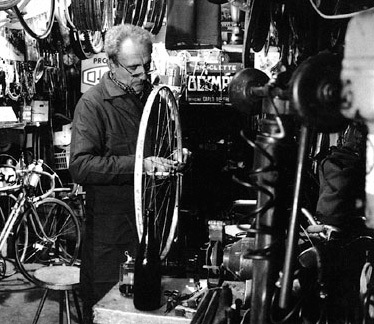 after all, even though there have been endless articles about frame fabrication, it would take a special kind of cyclist to consider the finer points of silver brazing, while sprinting for the road sign on a sunday morning. but with an apparent increase in the number of firms offering to custom design or print your team or club jersey, a basic understanding of the possibilities probably wouldn't go amiss. what you are unlikely to have access to, unless money is seriously no object, is a jersey akin to those worn in the seventies and early eighties; wool, with flock lettering. the nearest offering to this available today is from british trendsetters, rapha, and at least one jersey range from new zealand's solo. rapha employ sportwool almost exclusively throughout their jersey range, which is dyed to their colour specifications, and with most logos embroidered. the exception to this would be the rapha condor recycling team jerseys which are, again, sportwool, but with the white logos applied by screenprinting on the surface. solo, from down under, construct their equipe range of long sleeve jackets/jerseys from mapp, a similar merino/polyester fabric to sportwool, but in this case any logos are permanently 'flocked' onto the outer surface. but when we begin to consider the lycra jersey, which is certainly the mainstream offering from the majority of cycle clothing providers, we begin to have some (restricted) options as to how these might turn out. 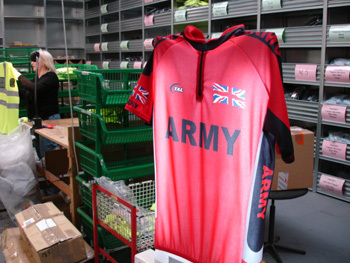 solo's paul mason explains: "nearly all cycle jerseys are printed using dye sublimation. this involves printing the design in reverse onto a special sublimation paper, which is then placed ink-side down onto blank fabric (it now reads correctly) and pressed in a heat-press. the ink is transferred onto the fabric - more importantly it is actually embedded in the fabric, rather than sitting on the surface like a typical t-shirt print. 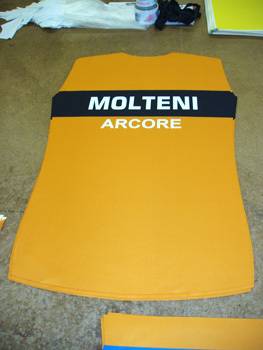 this is all done on the fabric panels before the jersey is sewn up." this is how the majority of jersey design reaches the lycra or polyester these days, and there are undoubted advantages in doing it this way, particularly where commercial sponsorship enters the fray. with more and more emphasis on brand identity these days, it doesn't seem too unlikely that any given sponsor might like to have their logo in much the same colour as it appears on the side of their vans or headed notepaper. in commercial printing, by which i mean something like a colour magazine, all those different colours that exist in photographs and adverts are achieved by the use of only four colours: cyan, magenta, yellow and black (cmyk). by carefully printing different dot densities of each colour (look close enough at a printed page and you'll see) it is possible to fool the human eye into believing it is viewing in living colour. paul mason from solo again:"have a look at a typical trade jersey nowadays and you'll notice it's probably got half-a-dozen sponsors names on it. each of these may have several different colours in their logo and this is where digital printing comes into its own. 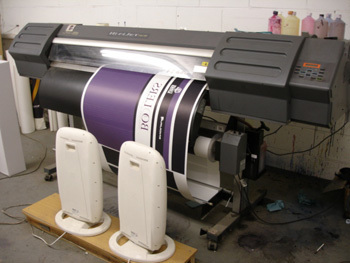 so the sublimation process is carried out by setting up artwork on a computer, then printing onto the paper using a large format digital ink printer. alan blue of scottish based endura/tal clothing said, "the printer is just like those found in a graphics studio, but we substitute the regular ink cartridges with inks appropriate to the sublimation process. this has reduced the setup costs drastically in the past few years, and subsequently the costs involved in smaller runs of each design" each component of the jersey - sleeves, front, back and side panels - is printed separately, with a separate piece of paper printed for each component of each jersey..
however, as comedian jiminy cricket would have said, 'there's more'; dye sublimation was preceded by a more complex process - screen printing. solo cyclewear of auckland new zealand use this method exclusively to produce their classique range of jerseys. paul mason explained,"with this method a separate piece of film is created for each colour used on the jersey. the film is placed onto a mesh screen which has been coated with a light sensitive emulsion and exposed to the light. the exposed areas are hardened whilst the unexposed areas are washed away allowing ink to pass through. each colour is printed separately, with the image being built up colour by colour." 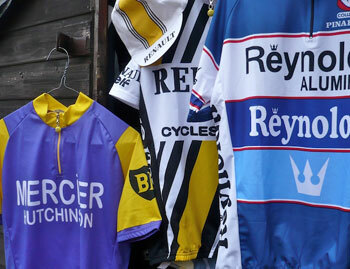 "our aim is to produce a jersey with rich and vivid colours and a 'sharp' print. if you take a close look at a sublimation printed cycle jersey, compared to a screen-printed jersey, the image will be quite fuzzy around the edges.". this is where the 'old' technology of screen-printing is seen as superior to digital printing. in solo's case, the screen-printing inks are mixed to paul's specification - standard digital inks can only achieve a restricted range of colours. screen-printing inks, generally speaking, are more resistant to fading, and can produce a much richer, denser black ink. 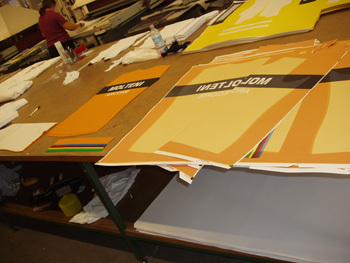 large areas of solid colour are perfect for screen-printing but more difficult to achieve with digital printing. of course, screen printing comes at a price; solo's latest konig jersey sells for £63 ($117) as opposed to around £40 ($80) for a standard trade jersey. 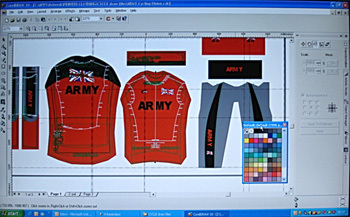 as described by alan from endura, dye sublimation has minimal setup costs, whereas for every colour used in the design, a separate screen has to be created. and that costs money. and the march of technology isn't making the quest for perfection any easier. solo's inks are made in italy, and it was a delay in acquiring one of the colours that subsequently delayed the release of the konig design. in practice, the sublimation print is the one we'll most often be exposed to, particularly if you're the poor sod left with the job of designing the 2009 edition of the buckled wheelers' team strip. with the exception of the sportwool/mapp incarnations, it's worth bearing in mind that both screen printing and digital printing are applied to plain white fabric - in this sense, there is no such thing as white ink. after all that, the humble jersey will never seem the same again. i am indebted to alan blue at endura/tal for both info and photos, andy storey of prendas for the santini photos, simon huntsman and zepherine craster at rapha, and particularly paul mason of solo, without whose input, this article would not have appeared. with the running of today's liege-bastogne-liege, that pretty much brings the spring classics to an end, and we can all breathe a collective sigh of joy (because there has been some fabulous racing over the past month), and now look forward to the grand tours. 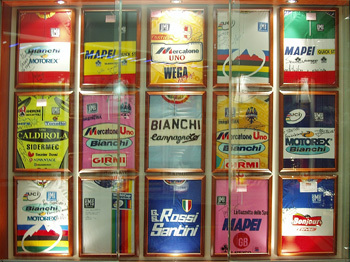 first in the sequence is the giro d'italia starting on 10th may when all will be looking at each other to see who might conceivably be looking good for july. but our love affair with the one day classics often seems caught up with the appalling weather that has characterised these races in past years, when riders have reached the finale looking worse than sven nys after a particularly muddy cross race in december. add to that the terrain covered; cobbles, mud, broken road surfaces, often all in the same race. watching the coverage of today's liege race, there were some interesting tarmac patchwork creations along considerable lengths of the parcours, very much at odds with the often freshly tarmaced and white lined stretches of route in the giro and tour. 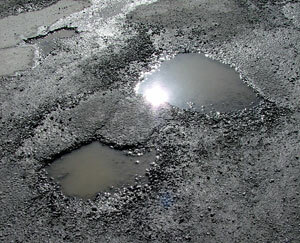 and with this in mind, are we not particularly guilty of double standards when it comes to road surfaces? take a quick look through your copy of velopress' paris roubaix - a journey through hell, to see why they call it the hell of the north, and tell me you're not disappointed when the last running of this, or other spring classics featured arid, dry and dusty weather. and isn't it contradictory that i, and several others on this side of the channel cheerfully contribute our annual €20 to les amis de paris roubaix to help them maintain and discover the pave that characterises the whole event? the delight of watching almost two hundred riders ploughing across french farm tracks that only subjectively fit the description road, expecting broken bikes, broken wheels and even broken riders. however, we then take it upon ourselves to moan amongst ourselves, or even write letters to the comic berating our local councils for leaving our daily travail or weekend workout in such a sorry state of disrepair. does this mean that we're getting soft? dunlossit estate is in the process of constructing a new islay abattoir (as a vegetarian, it gives me no pleasure to write this) on the bottom section of the glen road, and in so doing, managed to destroy a perfectly crap piece of road. however, it didn't stop there; the estate then decided to log the conifer wood on the opposite side of the road, and the rather large trucks they used to remove the logs, finished the road off for good. in deference to our favourite race of the season, we at velo club d'ardbeg renamed this stretch, the abattoirenberg forest, and believe me it falls not far short. but generally, it would appear that the state of britain's roads, especially those lesser used back roads, would seem to be in less than pristine condition. but instead of moaning about it, embrace it; take it as a challenge, impersonate maggie backstedt. let's make ourselves honorary flandrians, because it's unlikely to get a lot better, but if we ride them hard and fast, we might make ourselves so. and while we're here discussing why it's a hard road we ride, thewashingmachinepost company colnago is about to become superbly equipped for the task in hand. just arrived at washingmachinepost towers are a pair of chris kinghandbuilt wheels, using the company's latest cyclo cross hubs built with dt spokes onto dt swiss rims. 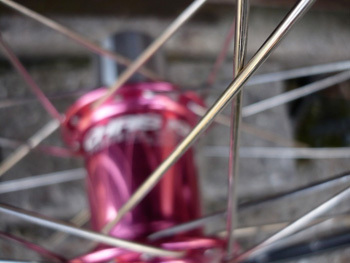 these wheels look, to use a rather overused word, awesome, to say the least, and will soon be joined by an american classic cassette, allowing the shimano compatible freehub (chris king do not manufacture a campag model) to fit with the 'campagnolo spoken here' diktat of the post. i'll let you know how we all get on together in the fullness of time. secondly, the picture break-up was fierce; losing picture is something not uncommon on cycling.tv, generally due to bandwidth issues on islay, but it appears the constant loss of picture was emanating from georgia, since the broadcast continually switched to the two commentators who seemed as bemused as the rest of us. however, the biscuit was taken at the end of saturday's stage when kanstantin siutsou (or svitsov, if team high road's website is to be believed) nipped off ahead of levi leipheimer and trent lowe, the latter in the leader's jersey. the television cameras stuck with the stage winner both before, during and after he crossed the line, so the tv audience (in this case, me) were not shown who came second - in fact, lowe nipped ahead of leipheimer but still lost the lead. this is not the way to present a major stage race, no matter in which country it is being held. the company colnago has been the proud bearer of a brooks swallow leather saddle since october last year - it's currently the subject of a long-term test, but suffice it to say that its comfort has been disarmingly loyal to my bum. this very item retails at around £150 (about $300), but is by no means the insaner end of the money that can be spent on posterior support for a bicycle; there are carbon versions that all but double that cost. so if we assume that there are folks out there willing to part with that much dosh on which to place their padded rear ends, there must, logically, be cyclists who feel this to be value for money. why then, bearing in mind that it is one of the three points of body contact on a bicycle (of whichever flavour) is there such a sharp intake of breath when rapha cheerfully invite us to spend £90 ($152) on a pair of their grand tour gloves? and not even with long fingers. however, as previously touted by the chaps and chapesses from perren street, these are constructed from african hair sheep skin, without doubt, the softest leather it has ever been my good fortune in which to place my hands. just to confound henry ford, these are available in any colour you like, as long as it's white. the back is perforated, with holes for the knuckles and a large enough gap to provide the customary cyclist's tan, should we be fortunate to experience enough sun during a british summer. if there is one minor disappointment, it's the velcro fastening - last year's limited edition gloves (the green or purple ones) had popper fasteners, far more in keeping with their provenance, and giving a little extra for that £90. i'm one of those cyclists who not only dons a helmet before setting out on a ride of whatever distance, but always places a casquette underneath. i like cycle caps, something to which the large collection at the side of my wardrobe will attest. many of these are manufactured in the traditional manner: five or six triangular cotton panels sewn together with a complementary peak on the front. most are one size fits all. rapha don't always do things that way; yes, their special edition roller racing cap fits that description, but the more exotic end of their range feature a centre panel, joining two side panels and a peak that makes it a cycle cap. 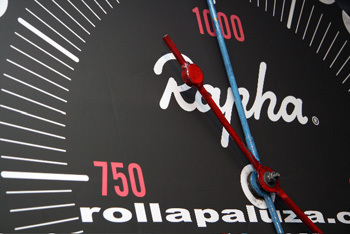 this provides a surface free of seams to accept the necessary centre ribbon (in this case, rapha racing pink) which continues over the top and bottom of the peak. thus, whether you ride with the peak up or down, your peloton will always identify the stripe - helmet off or on. rather than being mundane cotton, the team issue features breathable water and wind resistant, schoeller 3xdry cotton. the centre panel has an elasticated strip at the back to keep it in place, but unlike the majority of casquettes, rapha's team issue is available in small, medium and large. in keeping with its status as the icing on the rapha condor recycling.co.uk team kit, the right side of the cap bears the logos of the three principal sponsors while the left side has the rapha logo and the words team issue subtly embroidered in black. 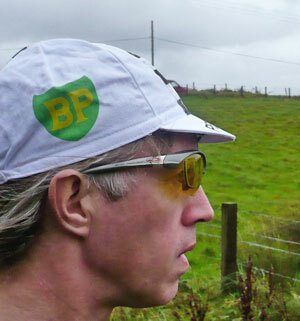 a cap, is a cap, is a cap; unless it's a rapha team issue. the cap is available from rapha.cc at a cost of £25 ($40). however, all good things are deemed to come to those who wait, and finally the rapha condor recycling team website is alive and well and filling pixels in a web browser near you. it's worth taking a look at and a touch more organised and stylish than one or two others i would be loathe to mention and with the added benefit of ben ingham's photography. while you're there, take a look at the favicon in the extreme left of the address bar - a graphic i have duplicated above left. wouldn't this just make an excellent national flag? are the old ways the best? this rumination has been instanced by one of my more regular correspondents, who sent me an e-mail entitled training advice... and contained the photograph seen right. having been able to convince myself that i have been training since the end of last year, this came as a bit of a wake up call. as i have never tired of telling anyone within earshot, i've been adhering (loosely, admittedly) to that suggested by thomas chapple in his base building for cyclists. well, ok, i've been adhering to a small part of chapple's directive, the bit that attracts most of us, going slower to go faster. as i understand it, this means riding the initial base mileage (kilometreage?) at a low heart rate, thereby educating the body to burn calories from fat, rather than carbs. last year, having never stuck to a training plan in my life, this is the very system that eventually got me through the 2007 london-paris without needing to call on a paramedic at any stage. however, open the comic on any given week, and you'll find yet another training method seemingly guaranteed to let you give boonen a fright in the sprint, or call robert gesink's bluff on a steep incline. there seem to be as many methods of attaining thighs like chris hoy, as there are cyclists, and since training is generally not the sort of thing you complete over the course of a weekend, it could take the better part of one's cycling career and a lot of training diaries, to find out which is the most suitable. always in the back of that honed, athletic mind, is fausto coppi's mantra ride a bike, ride a bike, ride a bike. whether il campionissimo actually ever said this, is really neither here nor there; when you think that greats such as anquetil, bobet, merckx et al, covered more (often unpaved) ground and won in more races over the course of a year than today's comparatively cossetted professionals (let's not kid ourselves here - mr armstrong didn't exactly knock himself out on a variety of start lines), and their training hardly had the benefit of vo2 max tests, and a polar stuck to the handlebars. however, if we're willing to accept that parametric technology, and our understanding of human biology have both progressed in leaps and bounds over the last few years, it makes perfect sense that training methods based on this new understanding should provide measureable improvements. but there is always the danger of throwing the baby out with the bathwater. i'm not suggesting for one moment that today's cyclists gain their promoted fitness by simply strapping on a chest strap and walking out to the bike shed - there's still a great deal of hard graft involved, but it is somewhat of a worry when you start reading about portable blood lactate analysers. this seems like the opposite end of the spectrum from nose to the bars into a headwind. if you're a signed rider, or member of a club with a qualified coach, there may be suitable benefits in taking advantage of all that's sanely available, but with more sportives, and more participants in same, maybe thousands of kilometres at varying tempos might still be the answer. will it make me faster? probably. can i bothered with all the measuring fol de rol instead? probably not. however, in saying that, i'm no spring chicken and any increases to be gained from scientific methods are probably long past; and i'm sure that there are more than one or two of us in this category. 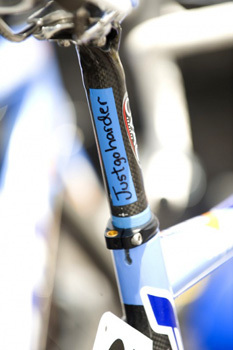 in which case the most economic and satisfactory method might be to put a just go harder sticker on the seatpost. i have been conducting some completely unscientific testing over the last few months as to which frame material transmits the most noise. not, as you may suppose, road noise, but those really annoying noises that you can never quite nail down to one particular component, or to one specific area of the bike. 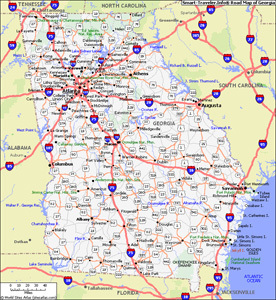 it's probably a generally accepted truth that this area always used to be the bottom bracket region, if only because the old cup and cone diehard left a lot of empty space around it. i'm sure you all know of which i speak; on a calm day (you can see why the research took so long) when the tyres are pumped to their optimum, there is smooth tarmac underfoot (i refer the honourable gentleman to my previous remark), and passing vehicles and nattering team-mates are at an absolute minimum. that's when a previously un-noticed sound makes itself heard. but at the time, you need to keep eyes on the road, rather than looking down to ascertain from where such is coming from. but does the type of frame you are riding have any bearing on whether you hear the noise at all, or give more of a clue as to its epicentre? well, yes and no. the trouble with thewashingmachinepost's clearly unscientific method is that it's very difficult to find carbon, steel and aluminium frames that all have the same problem. in fact, it wasn't easy finding a problem to have on any of them. sadly, for those of you who own a titanium frame, you'll have to figure this out for yourselves, because i couldn't get hold of one to try. however, the other three were reasonably easy to acquire. lest you think i have a sad enough life that i spent days and days on this, rest assured that this was so unscientific that it was only when riding one of said bikes, that i remembered this was what i had intended to do. and invariably on those occasions, the bicycle emanated no more than the expected noises. however, enough of the precision testing method - what's the answer, i hear you ask (or at least, those that haven't wandered off by now)? entirely subjectively, it was the aluminium frame that seemed to transmit sound more than the either the steel or carbon, but the steel made it easier to find where the noise was coming from. the carbon frame did neither particularly well, something i had rather expected, due to the resonance damping inherent in a decent carbon frame. shall i elaborate? the aluminium bike suffered from an inadvertantly loose quick release on the rear wheel, and while the strange rattling noise was well transmitted to the rider, the sense of direction was well off; i spent ages trying various cures, mostly at the wrong end of the bike. the steel bike had a loose crank bolt (on one of the newer external bearing sets) which was very easy to trace and just as easy to fix. the carbon frame was much harder - in fact, if i'm quite honest, i haven't yet traced the noise because it seems determined to hang on to its secret. i have removed and re-fitted endless components and lubricated pretty much everything i can think of. disturbingly, it's a noise that's not always there, but i don't know if that's the carbon masking it, or some other reason. of course, in the true tradition of all good (or bad) bicycle noises, all frames only exhibited anything when riding on the open road. there wasn't a hair out of place when any of them were placed on the workstand. aren't you glad i told you that?